And perfect venue for the launch of COSA NUESTRA (Our Thing) on April 23rd. 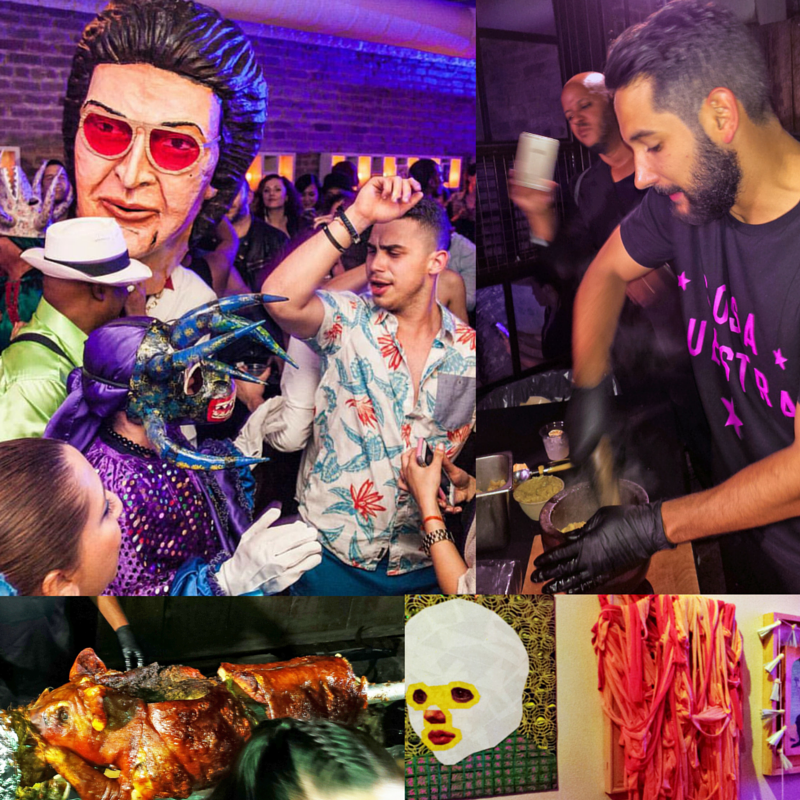 Located in the heart of New York City, where the Lower East Side meets Soho, Zen House welcomed a diverse crowd of Latinos eager to celebrate Latin America’s gastronomy, culture, art and music at the beat of COSA NUESTRA. Exquisite delicacies flowed continuously through the evening featuring sophisticated interpretations of traditional Puerto Rican favorites such as the alcapurrias with beef tartare and avocado aioli; bacalaítos (codfish fritters) topped with sweet potato mouse and caviar, and serenata of chayote, potato foam and plantain gremolata. Swing to the bar for clever cocktails created by masterful mixologists. Signature libations included the Cosa Nuestra Punch (Sage, Pineapple, Kumquats Oleo Saccharum, Red Bull Yellow Editions); Lavender Mule (Aylesbury Duck Vodka, Lavender infusion, Citrus and Ginger Tea; the Spiced Old Fashioned (Don Q GranAñejo, Dried spices infusion, Facto Bitters); the Sandía Cooler (Don Q Cristal, Watermelon & Mint soda, Bitters), and the Bulls & Berries (Fords Gin, Citrus, Blueberries, Bitters, Dry spices, Red Bull Blue Edition). 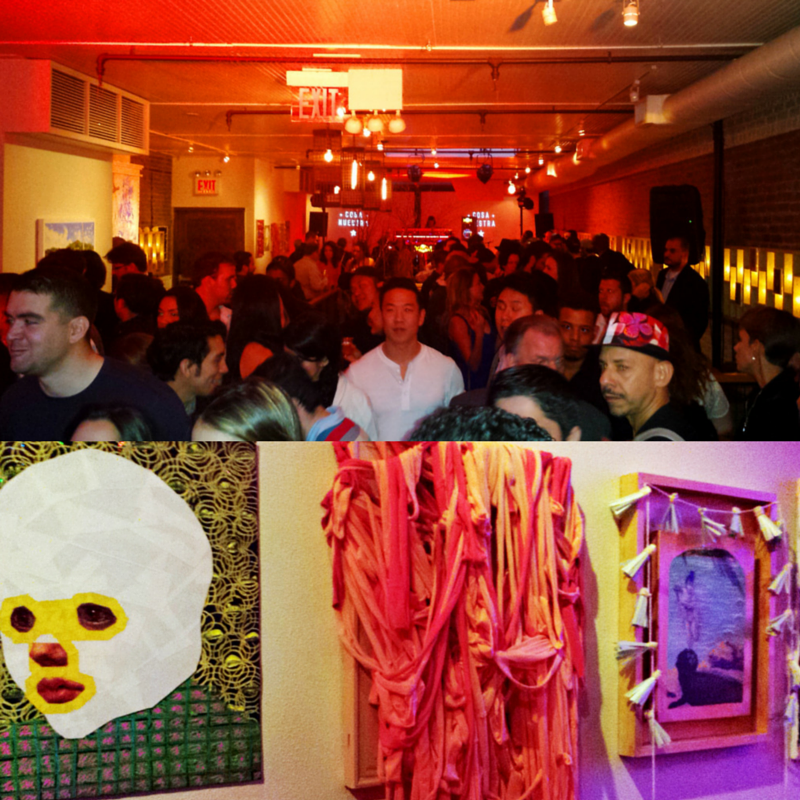 Head upstairs and navigate through the rhythm of salsa and a display of artworks by a talented group of up and coming Boricua and Dominican artists based in New York, curated by DIPSTERS. 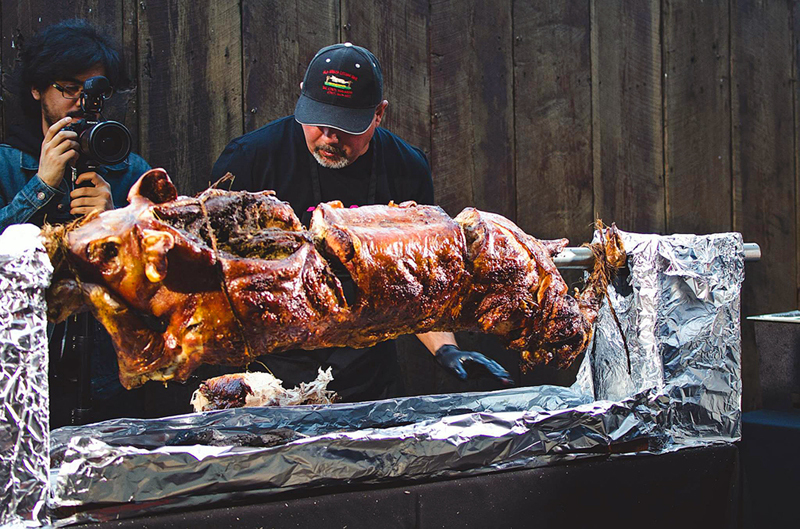 An outdoor patio opens up to a culinary heaven… and the protagonist: lechón a la vara con mojo (mojo-marinated roast pig on the spit). 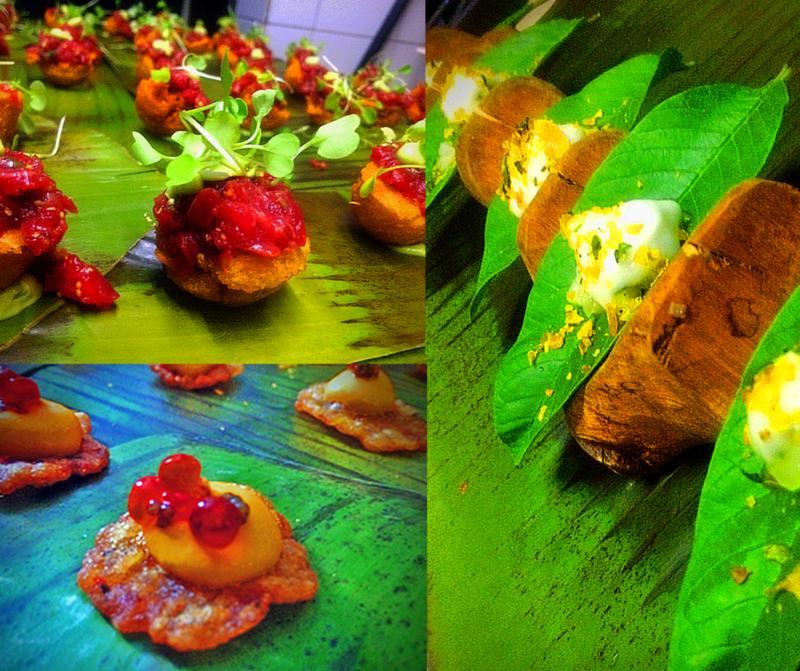 Pork belly and Octopus Pinchos, zesty escabeche…. 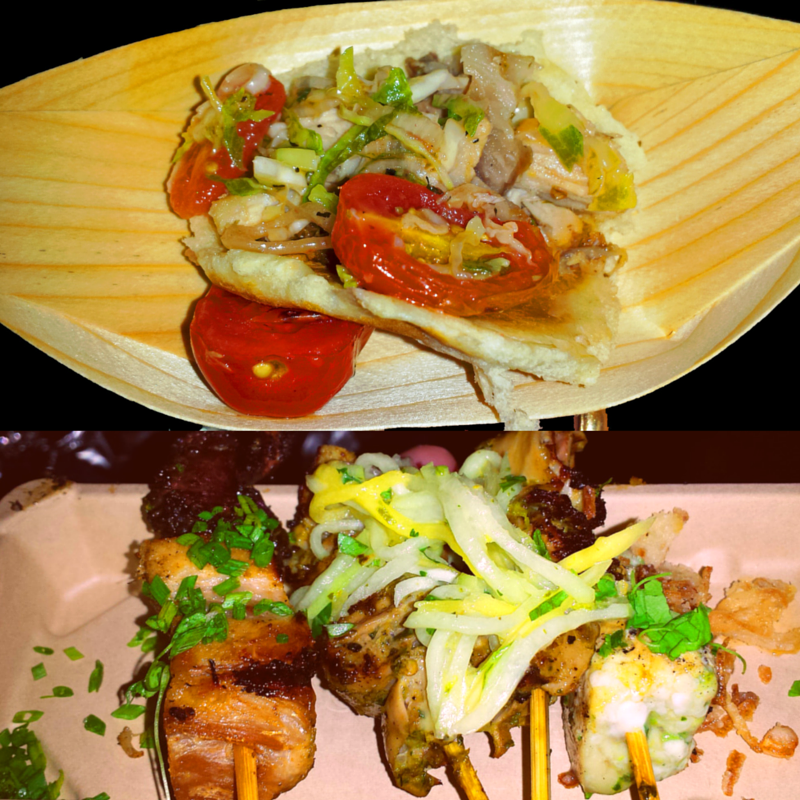 On the right, we were greeted by a wood plate with a tomato-cabbage escabeche-lechón salad served on pan sobao (sweet and soft Puerto Rican bread) and an assortment of delicious pinchos (skewers): swordfish with salsa verde; pork belly and octopus; garden vegetables, and cuajo (hog maw) with mojo. 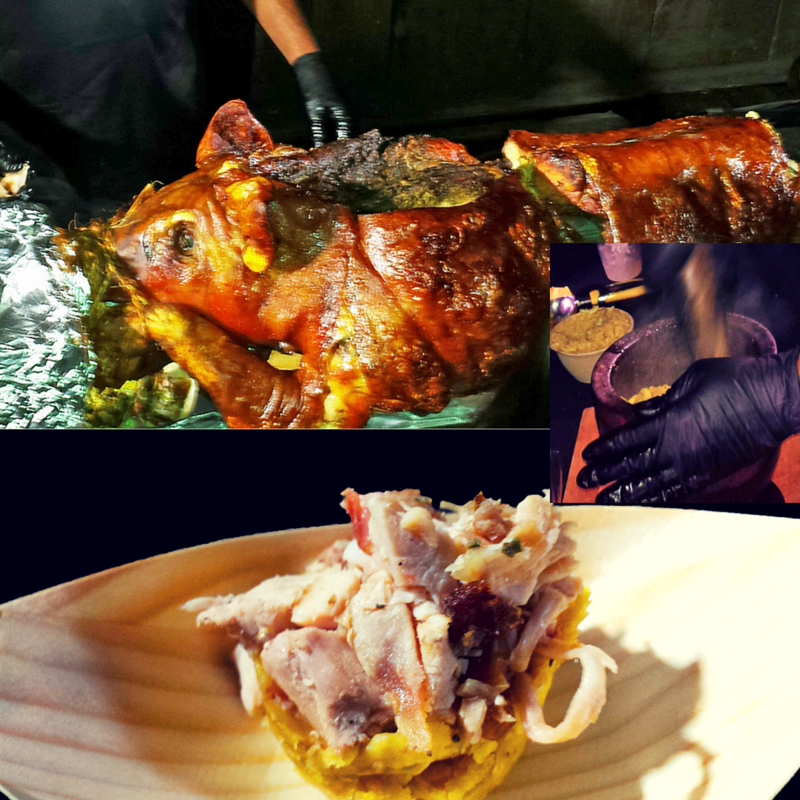 On the left, the perfect match to the lechón (roast pig) – a perfectly seasoned and shaped mofongo (mashed plantain) stuffed with lechón con mojo (mojo-marinated roast pork) . And for those who like hot sauce, a bottle of house-made Puerto Rican pique (hot sauce) was not to be missed. The highlight of the evening was the performance of the pleneros accompanied by the masterful artist and dancer Pedro Adorno on stilts, vejigantes with colorful costumes and masks, and the Cabezudo (Big head) personifying Héctor Lavoe of Fania All-Stars, the inspiration of COSA NUESTRA — created by Pedro Adorno exclusively for COSA NUESTRA. Photo Credit: Cabezudo (Big Head) | COSA NUESTRA / Megan Mack. 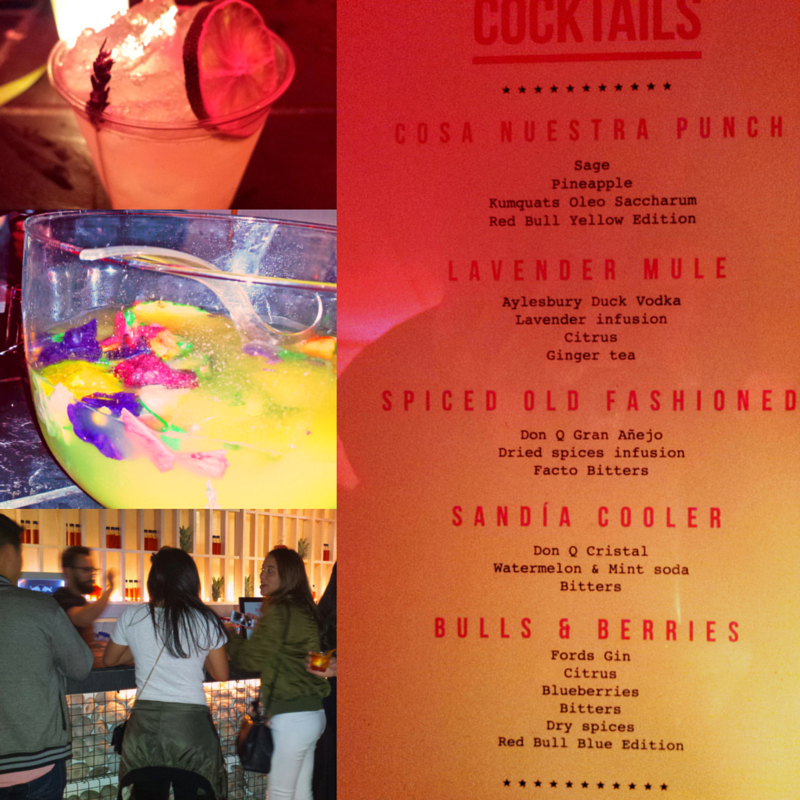 Manolo López, creator of the comfort food pop-up Mofon·GO in Brooklyn, New York teamed up with a group of top Puerto Rican chefs and mixologists to curate COSA NUESTRA’s launch event in New York City on April 23rd. 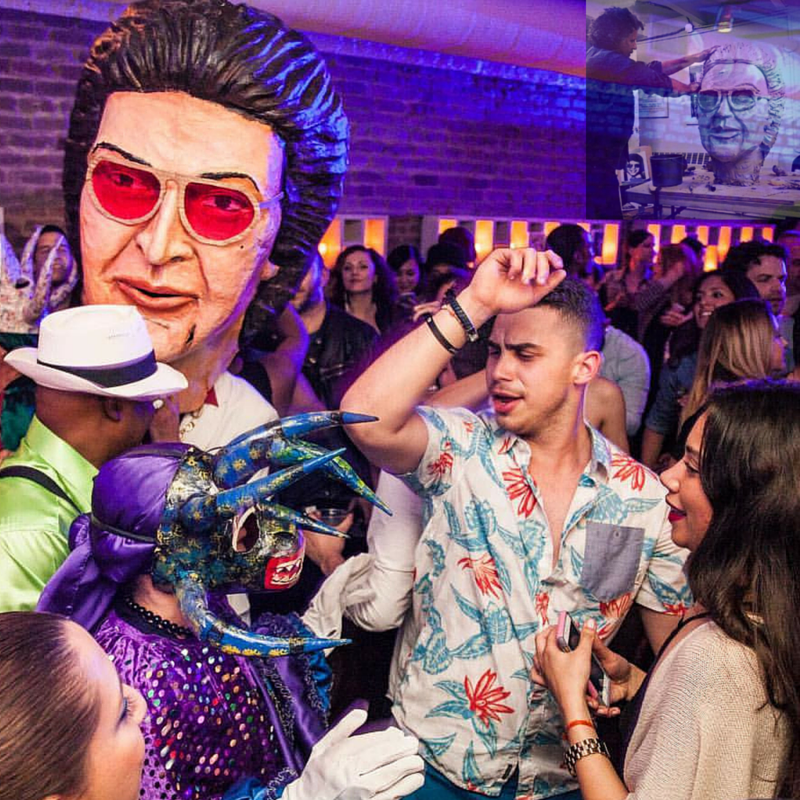 Rooted in the iconic Fania All-Stars, COSA NUESTRA is a celebration of Latin America’s cuisine, art, music and culture. “With so many negative news headlines surrounding Puerto Rico, COSA NUESTRA is our way of shedding light on the positives – the vibrant culture, the passionate spirit, and the tight sense of community,” says López. 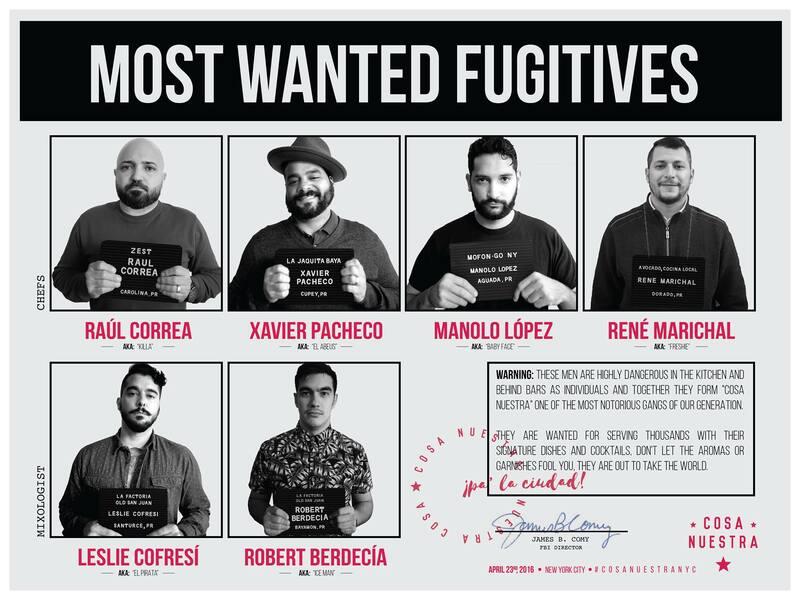 COSA NUESTRA’s team of Puerto Rican chefs and mixologists include: Xavier Pacheco, chef of La Jaquita Baya; Leslie Cofresí, co-founder of La Factoría and owner of La Alcapurria Quemá; Roberto Berdecía, co-founder of La Factoría; Raúl Correa, executive chef of Zest Restaurant in the San Juan Water Beach Club Hotel; René Marichal, chef and partner of Avocado Cocina Local & Patio Bar, Gabriel Antúnez, chef of La Hacienda Meat Center, and Pit Master Fernando Luis Narváez. 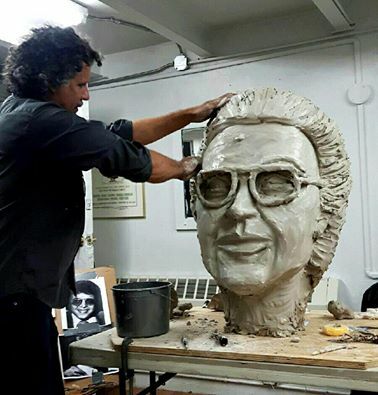 The COSA NUESTRA repertoire of artists include curator, Daniel Baez of DIPSTER, and artwork by talented Puerto Rican and Dominican New York-based artists featuring Pedro Adorno, Héctor Madera, Héctor Arce Espasas, Jonathan Torres, Fernando Pintado, Heryk Tomassini, Ricardo Cabret, Sebastian Vallejo, Christopher Rivera, Joiri Minaya, and Dulcina Abreu. Music performances featured the talent of Flaco Navaja and the Razor Blades, and DJ sets from Raquel Berríos (Buscabulla) and Riobamba. Ready for More? Stay tuned for the next COSA NUESTRA event!